The Hellgate squad is back to defend their title as champions of the Need for Speed Relay this year on June 8, 2008. Amazingly enough the same members are all fit to run again and this time we are asking for your help in two possible ways. The relay is 53 miles long with the start at Bear Mountain and the conclusion in New Rochelle. The course is a mix of distance, road, and trail. 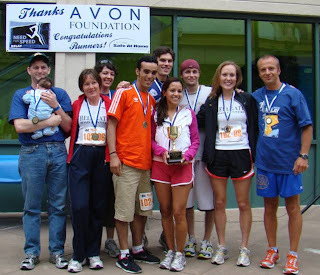 Our co-ed relay team would love to invite everyone to come out and cheer us along the way or on to the finish. Last year our determined anchor leg, Kevin Starkes, overcame a ~3 minute deficit to pass 2 all male teams for an exciting and close victory! Thank you all for your support and we hope to see some of you on June 8th! P.S. There is another relay in Long Island during the summer that we have not had a team for in years, if ever. Anyone interested in getting a team or 2 together for a later summer relay? Yvonne! That will be great! Look for Ashley and Aidan near the finish line too! Hope to see you after!